Your carpets and hard surface floors are often the first impression you make when a customer walks into your building. Make sure that impression resonates cleanliness and professionalism through ServiceMaster® Building Services carpet and floor care. Hard Surface Floors - ServiceMaster® Building Services knows the proper care regimens for a variety of hard floor surfaces including vinyl, ceramic, quarry, tile, and wood. 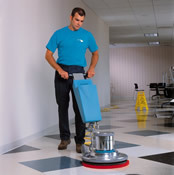 Other Specialty Cleaning - ServiceMaster® Building Services specializes in other types of commercial cleaning as well, including slip and fall solutions, window cleaning, computer room cleaning, and more.